We saw a half-baked version of LG's Lifeband Touch last year at CES, but couldn't actually play with it, and we never actually saw the fully torqued tracker come to fruition. This year the fitness tracker is back, and it is surely trying to be a whole lot of things all at once. Slated to go on sale in the the second quarter for $180, the Lifeband looks a lot like a FitBit, but it's a little pricier with quite a few more functions. It tracks your steps, distance, calories, and heart rate (but only when used with the LG heart monitor headphones, which we'll get to momentarily). It's more smartwatch than straight-up fitness tracker, in that it can sync with your phone through Bluetooth so you can get alerts for calls and texts or change music. The fitness bracelet is equipped with a three-axis accelerometer and an altimeter, so it can take into account your altitude and other factors that matter. 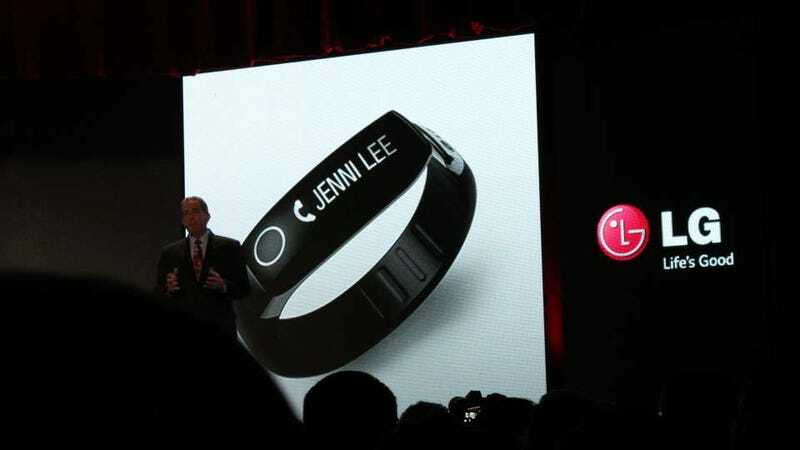 The Nike FuelBand, on the other hand, doesn't have a altimeter, so the data the LG band gathers might actually be a little more meaningful. Additionally, it responds to gesture-based controls, has a lithium polymer battery that holds a charge for five days, and is splash-proof. Elsewhere on the fitness front, LG will be selling a pair of $180 earbuds that track your heart rate later this quarter. They work with the LG FItness app (iOS and Android) and they'll give you cues during your run or however you're exercising to let you know how fast your little ticker is ticking. They have a three-axis accelerometer, Bluetooth connectivity, a mic for hands-free calling, and work with several fitness apps, like MapMyFitness, to name one. Apparently, they're meant as a companion with your Lifeband. However, that more or less leaves us wishing there were a decent fitness tracker out there already that would just do all of these things in one little package.